A folding chair and an American flag hang from a tree in front of a home in northwest Austin, Texas. At least two recent incidents in which empty chairs were hung from trees by rope have critics decrying what they say are racially offensive displays meant to symbolize the “lynching” of President Barack Obama. In Centreville, Va., an empty chair with a sign reading “Nobama” was strung from a tree in or near a park. “In short, this appears to be a crude metaphor for the lynching of President Obama,” wrote the blogger who posted the photo. The image of an empty chair has been associated with Obama ever since Clint Eastwood’s headline-grabbing, non-conformist speech at the Republican National Convention three weeks ago in Tampa, Fla. The 82-year-old actor-director talked to an empty chair as if the Democratic president were sitting in it, criticizing and mocking the “invisible Obama” for 12 minutes. “When somebody doesn't do the job, you've got to let them go," Eastwood said before making a throat-slashing gesture. Hollywood star Clint Eastwood speaks at the RNC in Tampa, Fla. 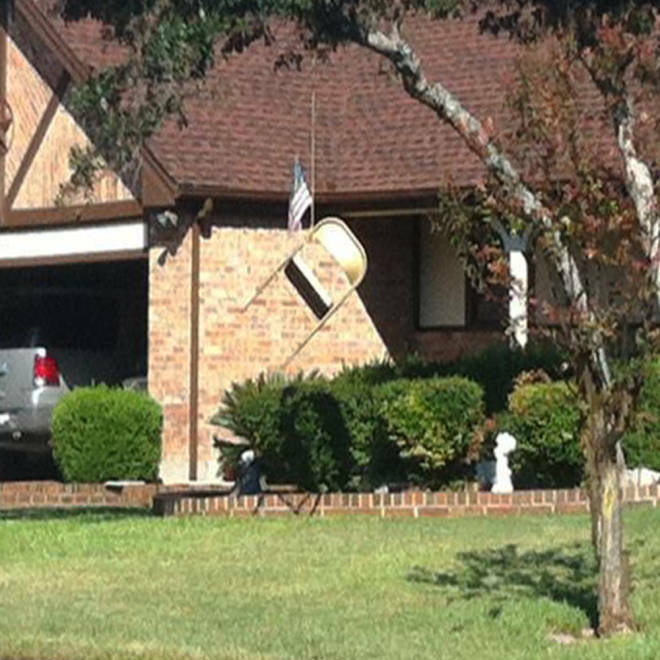 In Austin, Katherine Haenschen, editor of Burnt Orange Report, a Texas liberal-leaning political blog, said someone forwarded her a photo this week of an empty folding chair hanging from a tree in front of a home in the city’s northwest. A few days later the homeowner apparently added a small American flag to the display, according to a picture taken by a neighbor and forwarded to Haenschen on Thursday. [Picture above]. “He replied, and I quote, "I don't really give a damn whether it disturbs you or not. You can take [your concerns] and go straight to hell and take Obama with you. I don't give a [expletive]. If you don't like it, don't come down my street." NBC News tried reaching out to the man for comment, but a telephone message left Thursday morning was not returned. Haenschen said the display has apparently caused “great consternation” in the neighborhood. “There are other neighbors up there who are Republicans who find this as offensive as anybody else does,” Haenschen told NBC News. Rosemary Edwards, chairwoman of the Travis County Republican Party in Austin, said she was not aware of the display. She said if anything racial is suggested by the display, it would be "deplorable." 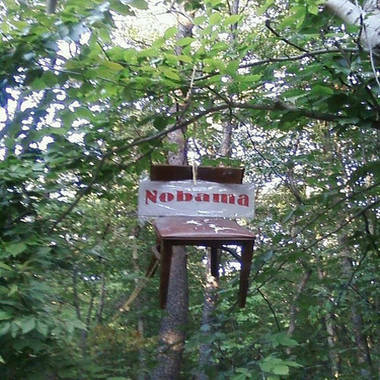 In Virginia, a photo posted on Tuesday on Blue Virginia, a Democratic-leaning political blog, shows an empty chair with a handmade "Nobama" sign strung from a tree by a rope. A chair with an anti-Obama slogan hangs from a tree in Centreville, Va. The blogger, who goes by the username “lowkell,” said photos of the display were taken with a cellphone by someone who was leaving the KORUS festival, an annual gathering organized by a local Korean-American association, at Bull Run Regional Park in Centreville over the weekend. “Obviously, it's beyond grotesque (it also boggles my mind that this was allowed to be put up, let alone to stay up, at a festival presumably visited by thousands of people - wtf? ),” lowkell wrote. Lowkell told NBC News the photo was forwarded to him by a source who "wants to remain anonymous." The display was on private property neighboring the park, a park official told the Centreville Patch. The park is about eight miles from Centreville High School, where Obama appeared at a campaign rally in July. It was not known who put up the display. The Secret Service said it was looking into the empty chair incidents. "The Secret Service is aware of this and will conduct appropriate followup," spokesman Brian Leary told NBC News. Lynching, the killing of people, usually by hanging or shooting, by mobs who take the law into their own hands, occurred most frequently in the U.S. from the late 1800s through the 1950s. Most of the lynchings took place in the South, and most of the victims were black.